Hello Grand Rapids! AQS Quilt Week opens tomorrow! I’m looking forward to a great week of demos of Brilliant Bindings in my booth (#321), vending my patterns, presenting at the All-Star Review, and teaching Become a Brilliant Binder on Saturday. Come by and say hi! Today’s Tips are from the class I taught in Deleware last week. With Diamond Tipped Tools, pre-cut strips are used for the pattern. Unfortunately, strips are not always cut equal. So. be very careful when using pre-cuts! Some students came to class with pre-cuts that had pinked edges. Those strips had extra width. So, I suggested we trim them, removing the pinked edges so all strip widths were exactly 2 1/2″! Looking at the photo you can see how the pinked edges are past the edge of Brilliant Bindings and over the 2 1/2″ line. #1 – Double check those pre-cut strips! They might need to be trimmed down OR you may haadjust the seam allowance to accommodate for narrow strips. When using Brilliant Bindings as a cutting template, I recommend you add “TrueGrips” circles to help grip the fabric so the tool doesn’t slide when cutting. If you look closely the photo you can see those circles on the tool. Another alternative to purchasing “TrueGrips” is “Invisi Grip”. I’ve also used painters tape, but it does not allow you to see through where the tape is placed. 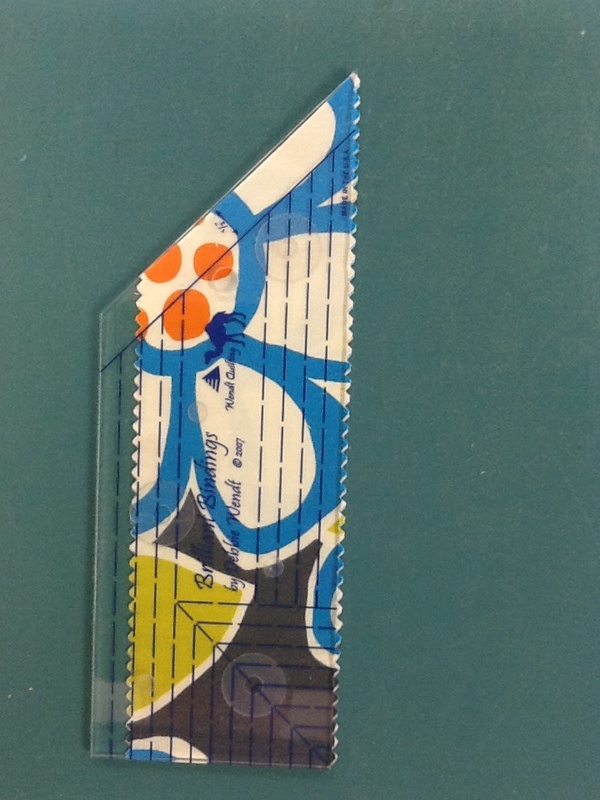 #2 – add “TrueGrips” or similar to rulers to keep them from slipping when cutting. This entry was posted in Brilliant Bindings, Jelly Rolls, Tips, Tools, Uncategorized. Bookmark the permalink. Great idea! Thanks for sharing…. You never know what products are in stores to help you with cutting your fabric…..